Drawing on more than 30 years of experience in ceramics, author Vince Pitelka has created the most practical, all-inclusive studio handbook for students, studio artists, educators and all those interested in the art of clay. The ten chapters in Clay: A Studio Handbook address the full range of ceramic processes, and bring a lifetime of ceramic knowledge directly into the hands of potters. Concerned about safe and efficient studio operation, Pitelka pays diligent attention to safety practices. Professional potters, students, teachers even serious weekend potters will find this book is their single best resource for gaining, retaining, and expanding a solid understanding of clay. And after that, this book helps you move your work forward, with detailed descriptions of techniques you may have tried and abandoned, or techniques you've been yearning to try out but didn't have clear guidelines for. Nothing on earth is more essential, more organic, more basic than clay. Children play in the dirt. They make mudpies. Kids like that (if they're lucky) grow up to be potters like us. We have a freedom that's often hard to put into words a freedom to express joy, sorrow, hope, whimsy, and more in a medium that flows beneath our fingers like a river of creativity. When it dries, we coat it in the color of our own imagination and relinquish it to another of nature's most basic elements: fire. What comes out of the cooled kiln is a snapshot in time, a moment of history forever frozen in its place a beautiful piece in the present that could easily become an artifact of the past in a future we may never see. As potters, as artists, we don't always see ourselves as playing a crucial role in history. But, then, neither did the first people who put hand to clay and made the first artistic expression of the human spirit in a form you could hold in your hand. Many of us work on instinct, on intuition beyond our time. But even with inspiration, the laws of physics still hold sway over the clay, and the more we know about its properties and potential, the farther we can take our work. There is such a vast amount of knowledge you need to excel as a ceramics artist, and no one head can hold all that information. Why does my beautifully shaped bowl come out of the kiln twisted? How do I incorporate more color into my work without glazing my pieces to death? When are my pieces dry enough to fire? Can I accelerate the drying process without putting my work at risk? What do I do when everything I throw comes off the wheel and heads right back into the recycling pile? Where do I begin to set up my own studio? Who can help me solve the big problems and the little ones? The author, Vince Pitelka, is an established ceramics artist. With more than 30 years of experience, Pitelka answers your questions about materials, studio safety, tools, equipment, clay and glaze mixes, firing processes and techniques, and more. Pitelka's descriptions and explanations cover every area of ceramics you can imagine, from pinch pots to studio setup to manageable marketing. Brush up on techniques as diverse as nerikomi (p. 118) and mishima (p. 108), or explore an unconventional approach to slab building. This is the most practical, hands-on reference book on clay you can own. Whether you're a seasoned professional, a teacher, a student, or a determined dabbler, this book is a valuable resource you don't want to be without. You'll go back to it again and again. The author of Clay: A Studio Handbook is Vince Pitelka, himself an established ceramics artist. With more than 30 years of experience, Pitelka answers your questions about materials, studio safety, tools, equipment, clay and glaze mixes, firing processes and techniques, and more. Pitelka's descriptions and explanations cover every area of ceramics you can imagine, from pinch pots to studio setup to manageable marketing. Brush up (or catch up) on techniques as diverse as nerikomi (p. 118) and mishima (p. 108), or explore an unconventional approach to slab building. 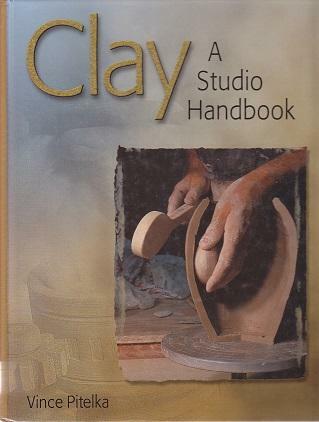 This is the most practical, hands-on reference book on clay you can own. Whether you're a seasoned professional, a teacher, a student, or a determined dabbler, Clay: A Studio Handbook is a valuable resource you don't want to be without. You'll go back to it again and again. There's just no way to hold all this information in your head all the time after all, you need some mental space to let inspiration roll around a little.